Don't call it a comeback — for some people, granite bathroom countertops never left. For others, who still consider the stone a has-been option from the 2000s, you'll be pleasantly surprised to learn that granite is once again gracing the inside and outside of many beautiful homes. And it's easy to understand the appeal once you learn a bit more about the material. So, What Exactly Is Granite? Granite is a sturdy, natural stone (whereas some stones like Silestone and Caesarstone are engineered), so it comes from quarries around the world. In case you slept through 6th grade science or aren't budding geologists: granite actually starts as molten magma that flows into other rocks and cools there. The stone is naturally quite rough and textured, but when it's ground and polished during the countertop manufacturing process, it becomes smooth with a lovely shine. The presence of certain minerals determines its color, which runs the gamut from neutrals and blues to yellows and reds. However, make sure you visit several stone yards to hand select your slabs since color can vary greatly depending on the stone's origin. This variety makes granite a great choice for many bathroom styles. 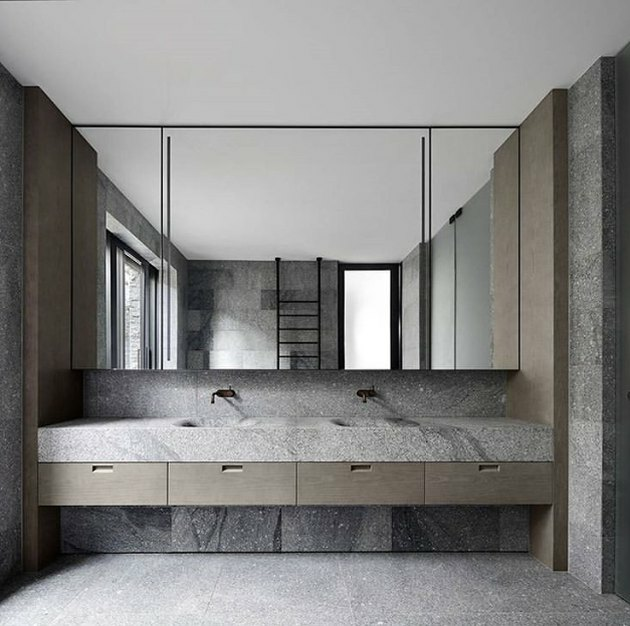 Darker brown-flecked granite with stained wood cabinets is the perfect combination for a Mediterranean or Tuscan-style washroom, while the image above shows how gray granite can work beautifully in a minimalistic space when paired with bleached wood. Granite is an excellent option for bathrooms. It is stain-, heat-, and scratch-resistant, which makes it a perfect perch for hairdryers, curling irons, lotions, and perfumes. However, as with any natural stone, granite is porous so proper installation and maintenance is required to get the most out of your granite bathroom countertops and keep them looking new for years to come. Talk with a professional installer to ensure that your countertops will be properly sealed when they're fabricated. This will prevent spills (which should be wiped up right away) from becoming permanent stains. Most natural stone needs to be resealed every one to two years and granite is no exception. Here's a great at-home test to check whether your granite is properly sealed: place a few drops of water on the surface. If it beads up, you have a secure seal and are good to go. If, after a few minutes, the water has soaked into the granite, then it's time to call a local stone technician and have them pay you a visit for some on-site restoration. Granite bathroom countertops are not as costly as marble but they are still categorized as a design splurge, costing anywhere from $15 to $35 per square foot for discount or clearance material, up to $170 per square foot for premium slabs with a custom edge. The ability to purchase granite in large slabs means you can have custom countertops without any visible seams or cuts; always a design plus. Caring for granite on a daily basis does not require going out and buying a special arsenal of cleaning supplies. Warm water, a soft, nonabrasive cloth and a couple drops of dish soap are all that is needed. Once you have finished wiping your surfaces down, remove any residual soap by wiping them one last time with just water. There are companies that make specific "for granite" cleaners that will work too, but you don't have to use those to get your granite bathroom countertops clean. If they are properly sealed (just to drive that important factor home again) they're relatively impervious to bacteria. Experts agree that staying away from acidic cleaners like vinegar, lemon or lime, anything abrasive, and anything with ammonia or bleach is a must, as they will break down and dull the stone over time. With proper care, granite countertops are highly durable, heat-, stain-, and scratch-resistant. They are a beautiful natural stone option that is more affordable than marble. It is available in a range of colors, making it a more economical stand-in for marble in a variety of decorating styles from country to Mediterranean. Granite is not a low-maintenance material. As with most natural stone, granite requires upkeep and care, such as wiping up spills right away. In particular, it absorbs oil quickly and the lighter colors show stains more and are softer than the darker ones. What Is the Difference Between Quartz & Silestone Countertops?